Experts believe that the president's position could be influenced by recent developments in relations with Washington, especially the Magnitsky Act. This was alluded to by Sergei Lavrov during the press conference. Source: Kommersant. 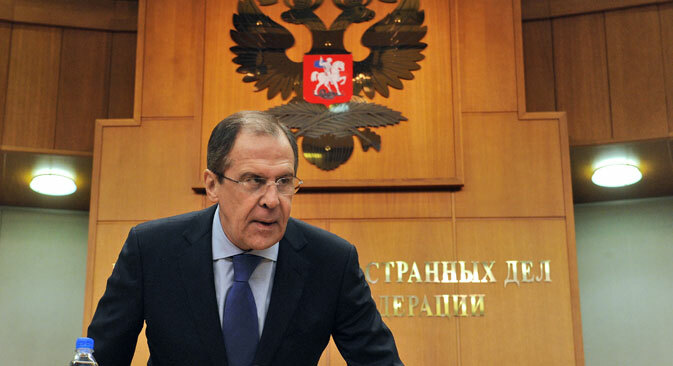 Foreign Minister Lavrov reveals that Russia’s draft Foreign Policy Concept is still under review by the head of state. Experts believe President Putin is looking for tougher rhetoric regarding Russia’s stance on interference in its domestic affairs. The new tone may be a response to recent events, including America’s adoption of the Magnitsky Act. During a major press conference on Jan. 23, Russian Foreign Minister Sergei Lavrov summed up Russia's foreign policy over the past year and spoke about the new draft of the country’s Foreign Policy Concept, which is due to be made public as soon as President Vladimir Putin puts pen to paper. The head of state has not yet signed the document drafted by the Ministry of Foreign Affairs. The new draft of the Foreign Policy Concept was sent to the Presidential Executive Office in late November 2012. It was expected that the document would be adopted and made public by the end of the year. However, in late January, Sergei Lavrov explained that the document was still "being examined by the presidential administration." Reports confirm that the draft is on Vladimir Putin's desk, but the president has not placed a resolution on it. According to a source in the Kremlin, the reason is due to "the president's increased attention to this basic instrument of foreign policy." "It is possible that a number of items have to be tightened; the issue of interference in Russia's internal affairs, for example, needs to be raised to a new level," said the source. The president's press secretary, Dmitry Peskov, confirmed that the document is still with the Russian head of state. "The decision to sign the document requires time," said Peskov. In addition, Peskov did not rule out that Vladimir Putin might introduce some amendments to the draft concept. Experts believe that the president's position could be influenced by recent developments in relations with Washington, especially the Magnitsky Act. This was alluded to by Sergei Lavrov during the press conference. "A new irritant has been added to the matter of missile defense: the Magnitsky Act, which cynically exploits a human tragedy in order to 'punish' Russia and intervene in the legal process, which our judiciary is dealing with and is still ongoing," said Lavrov. "U.S. lawmakers have donned the mantle of judges in matters relating to internal Russian affairs." On the topic of Moscow's response — the so-called anti-Magnitsky law — Lavrov underlined that the Russian authorities were forced to react. "It was not our choice. Our hand was forced, as there are certain rules that govern relations between countries, and such actions cannot be left unanswered," said the top Russian diplomat. Lavrov warned that Russia would continue to take firm action to prevent any attempts to interfere in the country’s internal affairs; he referred to Russia’s external “lecturers” as far from irreproachable in many ways. "We hope that Barack Obama's new administration will draw conclusions from this unfortunate episode, and will start to behave itself in accordance with our agreement: on the basis of mutual respect, equality, and mutual benefit, with no attempts to interfere in each other's internal matters," said Lavrov. According to Dmitry Trenin, analyst and director of the Moscow Carnegie Center, Lavrov's harsh words in the direction of the U.S. illustrate Putin's new foreign policy doctrine. "Every presidential term sees Putin launch a new foreign policy. Unlike during his first two terms, this doctrine brings domestic policy into much sharper focus. The new foreign policy is more isolationist in relation to the West," said Trenin. At the same time, Trenin believes the trend toward a tougher stance in relations with Washington manifested itself before the Magnitsky Act. "Among other factors, it was due to Putin's overall disillusionment with the U.S. and the West," the analyst said. The West's bet on Dmitry Medvedev was, in his words, seen by the Kremlin as an attempt to interfere in its internal affairs. "When Vladimir Putin stood on Manezh Square post-election and uttered through tears of joy 'we won,' it was a response not only to the internal opposition in Russia, but also to their alleged patrons and sponsors overseas," said Trenin. The adoption of the Magnitsky Act was, in Trenin’s view, the last straw that finally persuaded Putin to drastically increase the "sovereignization" of Moscow's foreign policy. "The delay in adopting the new draft of the Foreign Policy Concept seems to be due to the Kremlin's position that the Foreign Ministry's version is too soft and fails to take into account the most recent trends,” Trenin said. "The document has been sent back to be revised and toughened." A source in the Russian Foreign Ministry assured that, if new input for the Foreign Policy Concept were to come from the president, the document would be finalized in the shortest possible time frame.